Finally, we’re getting the weather we dreamed about during last winter’s Polar Vortex! 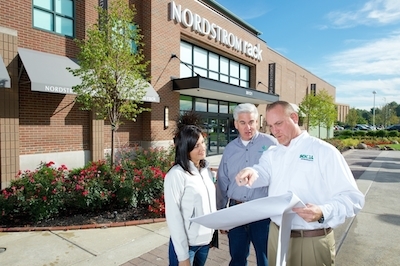 Snow feels far away, but Northern Ohio retail properties are wise to plan for the white stuff and how they’ll clear the way for shoppers and employees during snow and ice events. Your employees and shoppers will stay safe if you hire an experienced, responsive professional snow and ice management contractor that understands your property’s demands and is equipped to handle acres of parking lot surface, driveways and walkways. Don’t get caught with a severe winter storm warning without hiring a reputable contractor with your priorities top of mind. Here are the factors to consider before bringing on a snow removal contractor for your Ohio retail property. Snow and ice can present a serious hazard to the people who visit and work at your northeast Ohio retail property. Take care of shoppers and employees with a solid snow and ice removal plan that ensures clear parking lots, walkways and driveways before the work day begins and throughout snow events. When vetting an Ohio snow removal contractor, find out how many trucks they’re running. 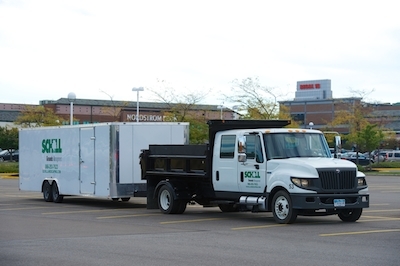 Schill Grounds Management has a fleet of more than 50 trucks on the road and the manpower to keep your retail property clear in the most severe winter weather conditions. Four branch locations increase our capability and improve response time. Plus, safety is our priority. We are certified by the Accredited Snow Contractors Association (ASCA), and our employees participate in rigorous training programs so every crew is implementing snow removal best practices and safety measures while on the job. Timing is everything with snow removal. Fast response time and reliable service are priorities when choosing a snow removal contractor for your northern Ohio retail property. And communication is the crux of response time: How will you contact your snow and ice professional with requests or concerns? 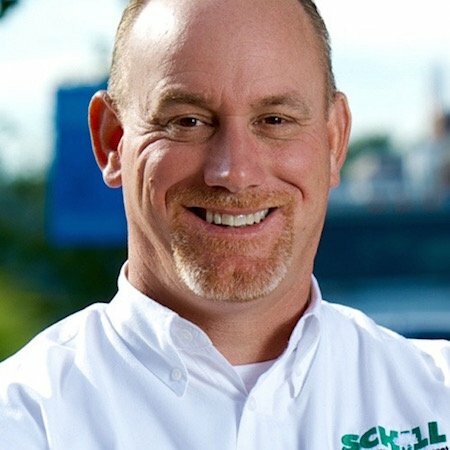 Schill Grounds Management answers that question with a client portal housed on our website. This is an easy-to-access single stop for clients to “find” us no matter where we are in the field. Every client is a priority. So if we missed a spot, we want to know. Clients can log into the portal, note any issues, and that request is directly sent to the client care specialist who manages the property. Our team receives constant reminders until the problem is resolved. It’s crucial to have a single point of contact: a face and name with a cell phone number you call anytime, and an email you can use to send quick messages at your convenience. Snow and ice can shut down your business if not managed properly. We understand the dire circumstances that winter weather presents, and open communication ensures that your problems are solved efficiently and effectively. Working with, not against, the environment is a value that steers many decisions we make in the products we choose and the methods we use to care for your property, whether removing snow or mowing turf. 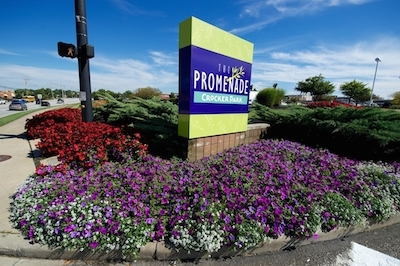 A commitment to sustainable snow removal practices matters to your Ohio retail property because mindful treatment of snow and ice helps preserve the landscape and keep it healthy come growing time in the spring. At Schill Grounds Management, we use an innovative liquid deicer in snow removal and we pre-treat our ice-melting products. This improves the performance of our ice-melting products, so we can shrink our environmental footprint on your property (less fuel) while saving you money (less product). Our pre-treated ice-melting products make for safer, faster snow removal. There is a science to applying ice-melting products: Tossing salt from the truck on to your parking lots and driveways is wasteful, expensive and unnecessary. All of our snow removal trucks are carefully calibrated to apply exactly the amount of ice-melting product required to safely, effectively manage your property. And yes, every property’s calibration requirements are different: We take the time to measure this and implement a plan in advance. We know that excess salt leaches into our water supply and harms the landscape that lies underneath that white blanket of snow. We are mindful of our use of ice-melting products—and that pays off for clients’ budgets, and their landscapes’ overall health throughout the year. Before contracting with a snow removal professional to manage your Ohio retail property, ask about the fleet and the approach. Size does matter! With more trucks on the road, you can rest assured that your property will be cleared in a timely manner. But don’t forget to ask about details. Does the snow management company have a hand shovel crew? How will your walkways and driveways be cleared, and how often? What will happen to the snow when it is cleared from the parking lot—does the company plan on piling it in a corner or completely removing it from the property? And how easy is the company to contact? Winter weather is a given in northeast Ohio. Is your retail property prepared to stay open and provide a safe environment for shoppers and employees? Let’s talk about how to keep your property in the clear during the most severe winter weather conditions. If you’re a current client, contact us so we can link you to the portal.